When certain holidays and special events come around it’s important for sellers to keep selling cutoff dates in mind to ensure buyers receive their orders in time. After all, happy buyers become repeat shoppers! 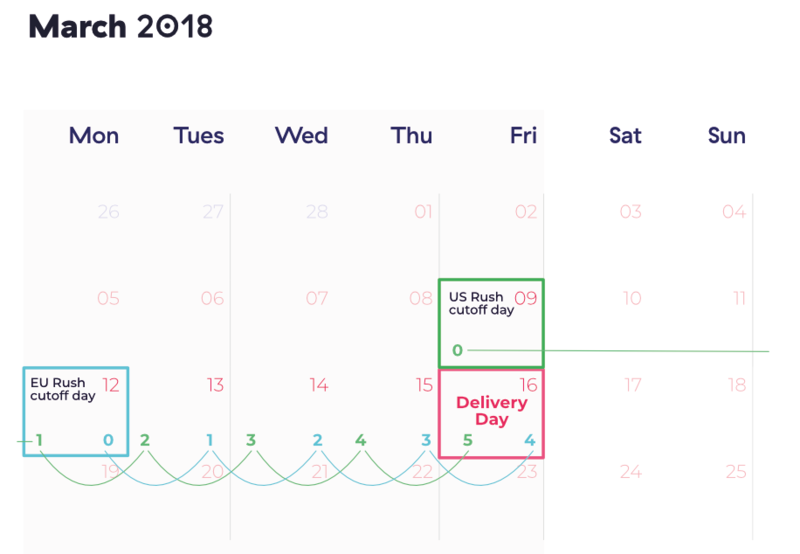 As a general rule, use the following timelines for selling cutoff dates—delivery timelines are usually faster than indicated below, but to be safe we’re suggesting the largest delivery window for your calculations. NOTE: Keep in mind standard shipping timelines start the day the selling period ends. Rush shipping timelines start the day the buyer places their order (not the day the print cycle ends). * Tracked shipping is not available for EU fulfilled orders at this time. If your listing is for a special holiday or event make sure to keep campaign cutoff dates in mind. NOTE: If a buyer is claiming their order has not arrived within the designated time frame please have them contact our customer support team using this form. For standard shipping you will need to ensure your product goes to print on the standard shipping cutoff date so buyers can take advantage of cheap shipping rates and still get their order in time. Once we’ve passed the standard shipping cutoff dates, buyers can still receive their products in time for events, but they will need to select rush shipping at checkout. Remember, with rush shipping you don’t have to end the print cycle by a certain date—but buyers will need to place their order and select rush shipping by the cutoff date to receive their item in time. When calculating dates make sure to keep the arrival date in mind, so for St. Patrick’s Day (March 17, 2018)—we’d want to plan for orders arrive by March 16th so people can wear their item on the 17th.